To conserve amphibians, reptiles and their habitats as integral parts of our ecosystem and culture through proactive and coordinated public-private partnerships. 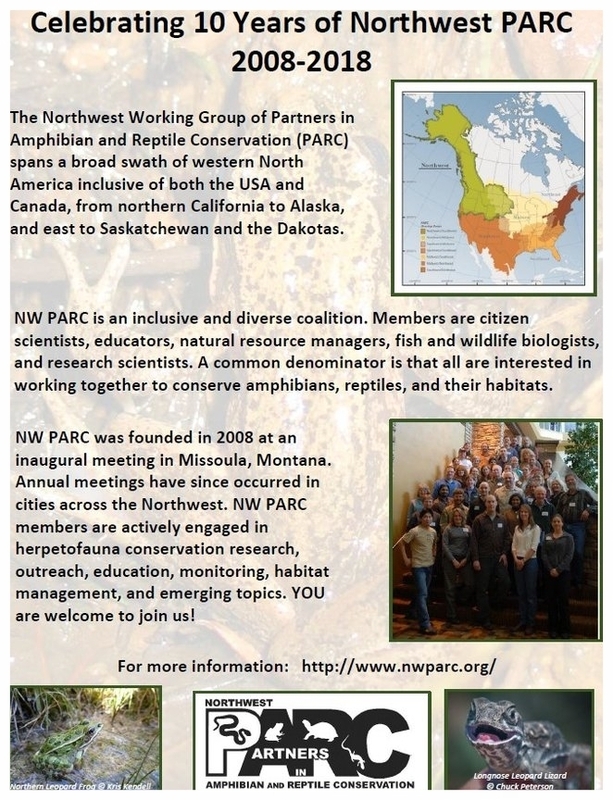 The Northwest chapter of Partners in Amphibian and Reptile Conservation's (NW PARC) was officially launched in 2008 in Missoula, Montana. Our region covers all or parts of nine U.S. states and three Canadian provinces and territories. Our membership includes individuals from government and nongovernmental organizations, conservation groups, museums, pet trade industry, environmental education centers such as zoos and nature centers, energy and forestry industries, educational institutes including universities, herpetological societies, and environmental consultants. The diversity of our membership makes PARC the most comprehensive conservation effort ever undertaken for amphibians and reptiles. Members of NW PARC are committed to promoting amphibian and reptile conservation. Please use the below form to contact us with general questions or comments. Thank you for reaching out to NW PARC. We will respond to your message as promptly as possible. Katy Weil has worked in wildlife conservation and environmental public policy for 34 years. She is currently serving as a senior science analyst within the Conservation Program for Oregon Metro Parks and Nature. She has been with Metro since 1998, and before that was the Oregon/Washington Coordinator for Partners in Flight as well as a program director for the Audubon Society of Portland. Prior to that Katy was a consultant for the United Nations Environment Programme, working with the Terrestrial Ecosystem and Programme Coordination Units, as well as working previously with the US Fish and Wildlife Service in the northeast. Oregon Metro’s Conservation Program manages and restores over 16,000 acres of natural areas and parks within the three counties in the Willamette Valley. Metro's program focuses upon attaining a desired future condition for wetlands, uplands, and riverine habitats via removal of invasive vegetation, planting of native material, and long-term stewardship. Monitoring these sites for response to restoration and maintenance actions involves amphibian, avian, mammal, and some reptile survey. Katy has a background in wildlife biology, particularly effectiveness monitoring and management, and applies this within a restoration context. She also confesses to be a happy bird and herp geek in her spare time, and thankfully her ten year old son shares that love of animals and natural places. Betsy’s interest in these species goes back to the early 1990s when she conducted surveys for western pond turtles and terrestrial salamanders on the Siskiyou National Forest in southern Oregon. She’s worked for the Forest Service since 1986 (excepting a tour in the Peace Corps and a few years taken off to do some writing), and being an agency biologist often means knowing just a little bit about many species, a fact that makes for an interesting and varied career. Betsy has worked with spotted owls, marbled murrelets, forest carnivores, such as martens and fishers, bald eagles, and, of course, many species of herpetofauna. Amphibians and reptiles, with their extraordinary lives underground (eg. ensatinas), or in the forest canopy (arboreal salamander), or on both land and water (many species), make them endlessly fascinating. This diversity also presents challenges for conservation, as their needs encompass having both riparian and terrestrial habitats that are clean and free from disturbance. Amphibians and reptiles also aren’t generally species that most people gravitate toward naturally, so making the public curious and concerned about them is a great task for a wildlife biologist. In Betsy’s spare time, she writes about the natural world and American history and has published articles in American Forests and various literary journals. David Pilliod is a Research Ecologist at the USGS Forest and Rangeland Ecosystem Science Center in Boise, Idaho. David has been studying amphibians and reptiles in the Northwest since 1995. He has been involved with NW PARC since the inaugural meeting in 2008 and served as Co-chair from 2009-2013. Elke Wind is a self-employed contract biologist working out of Nanaimo, British Columbia on Vancouver Island. She has more than 20 years experience studying amphibian populations, specializing in habitat management issues related to timber harvesting, non-native species, rural and urban development, and linear infrastructure (e.g. roads, right of ways). Ms. Wind is currently a member of NW PARC steering committee, was a former co-chair, and was involved in the development of various PARC products (e.g. HMG's). Dede received her Ph.D. in 1988 from the Department of Zoology at Oregon State University. Currently, she is a Research Ecologist with the USDA Forest Service Pacific Northwest Research Station in Corvallis, Oregon. Dede’s research interests include examining issues of conservation biology and ecology of amphibians in western Oregon. She has Courtesy faculty appointments at Oregon State University in the Departments of Fisheries & Wildlife, Zoology, and Forest Science. She serves as Associate Editor for Herpetological Review, Lead of the Global Mapping Project for amphibian chytridiomycosis, and is past Co-Chair of Partners in Amphibian and Reptile Conservation. Originally from Chicago, Laura Guderyahn moved to Portland in 2006 to serve as the Watershed Restoration Coordinator for the City of Gresham. After working for 8 years to implement restoration projects and monitor amphibian and reptile populations at over 300 sites around Gresham, she now works with the City of Portland's Land Stewardship - East program as a Natural Resources Ecologist. In this position, she conducts wildlife surveys and manages natural resource projects in a variety of habitats throughout Portland Parks and Recreation natural areas. She collaborates with technicians, planners, scientists, engineers, permit authorities, contractors, community volunteers and non-profit organizations to develop and implement natural resource management strategies and solutions. Laura has a BA in Biology from Augustana College in Illinois and a Master’s degree in Conservation from Ball State University in Indiana. Janene is Faculty and Chair of the Wildlife and Fisheries Department at Salish Kootenai College (SKC), Pablo, Montana. She has served on the NW PARC Steering Committee since the first meeting in 2008. Her interest in amphibians, reptiles and other wildlife has been life-long. Her first job was caring for the animals, including several reptiles and amphibians, at the Ogden Nature. While pursuing her B.S. in Wildlife and Fisheries at Utah State she worked multiple seasonal and campus positions as a Biological Technician. She completed her M.S. Thesis at the University of Arkansas then spent two years as an Ecologist for the U.S. Geological Survey, National Wetlands Research Center. During her time with USGS she worked on amphibian monitoring and habitat association projects before accepting a position as a Wildlife Biologist with the Confederated Salish and Kootenai Tribes. During her 12 years with the Tribes she worked with many species and on a variety of projects including a reintroduction of Northern Leopard Frogs to the Flathead Reservation. She began teaching at SKC in 2013 and developed the Wildlife and Fisheries Degree program. She spends her free time hiking, biking, skiing, birding, and ‘herp’ing with her two dogs, three sons, and husband Dennis (although not necessarily in that order). Chuck Peterson is a Professor in the Department of Biological Sciences where he teaches a variety of biology courses and advises graduate students. He also is the Affiliate Curator of Herpetology for the Idaho Museum of Natural History. Chuck’s research interests include the spatial and physiological ecology and conservation biology of amphibians and reptiles. Much of his work has focused on reptile populations on Idaho’s Snake River Plain and on amphibian populations in the Greater Yellowstone Ecosystem. He has been involved with PARC since its inception in 1999, serves on the steering committee of Northwest PARC, and helped found the Idaho Chapter of PARC in 2000, which he still coordinates. He and his students have contributed to several PARC publications. He has conducted herpetological training sessions for many organizations and is heavily involved in outreach education activities. He is currently focusing on a citizen science project utilizing the iNaturalist mobile application to document the occurrence of amphibians and reptiles in Idaho. Chuck is also an avid nature photographer and seeks to use his photography to conserve and restore amphibian and reptile species and their habitats (https://www.flickr.com/photos/petechar/).